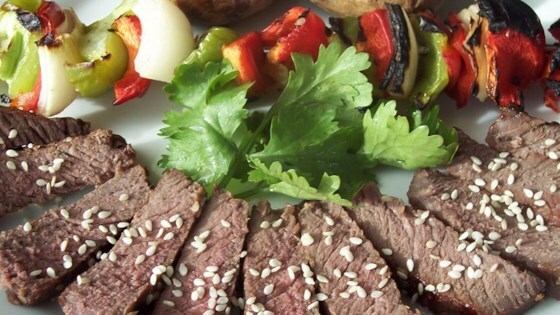 "This is a great marinade for beef short ribs, chicken, or steak. Serve with steamed rice, beer, and kim chee." This fell really short of my expectations I guess. I just didn't like it much. I think I will try it again with a longer marinade time (was overnight). My girlfriend and I enjoyed this recipe. I especially enjoy marinating meat for a couple of days before grilling, broiling, or frying. I substituted the sesame seeds with more sesame oil. It's very easy to do, all the ingredients are right under my cupboard. My husband loves it and it's very simple to do (or did i say that already?). unbelievable! great on chicken, beef, pork even shrimp! my husband really enjoyed it!